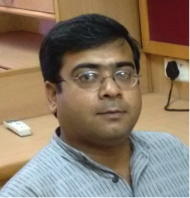 Dr Sourav Rakshit received his PhD and ME from IISc Bangalore in 2012 and 2006 respectively. He is a BE in mechanical engineering from Jadavpur University. He was a postdoctoral researcher at University of North Carolina at Charlotte from 2012 to 2014, and before joining IIT Madras he was institute postdoc at IIT Kanpur (May-July 2014). He worked as a scientist in the reactor engineering division in BARC from 2000-2004. Sourav’s research interests are in multibody dynamics, robotics, biomechanics, convex and topology optimization. Sourav Rakshit and Anindya Chatterjee, Scalar Generalization of Newtonian restitution for Simultaneous Impact, International Journal of Mechanical Sciences, 2015, vol. 103, pp. 141-157. Sourav Rakshit and Srinivas Akella, The Influence of Motion Paths and Assembly Sequences on the Stability of Assemblies, IEEE Transactions on Automation Science and Engineering, 2015, vol. 12(2), pp. 615-627. Sourav Rakshit and G. K. Ananthasuresh, A Novel Approach to Large Scale Polypeptide Folding Based on Elastic Networks Using Continuous Optimization, Journal of Theoretical Biology, 2010, vol. 262, pp. 488-497. Sourav Rakshit and G. K. Ananthasuresh, An Amino Acid Map of Inter-Residue Contact Energies Using Metric Multidimensional Scaling, Journal of Theoretical Biology, 2008, vol. 250, pp. 291-297. Sourav Rakshit and G. K. Ananthasuresh, Simultaneous Material Selection and Geometry Design of Statically Determinate Trusses Using Continuous Optimization, Structural and Multidisciplinary Optimization, 2008, vol. 35, pp. 55-68. Mangesh Pathak, Sourav Rakshit and Manish Gautam, Contact Analysis of A Gear Pair Using Linear Complementarity, 5th Asian Mechanism and Machine Science Conference, Bangalore, 17-19 December, 2018. K. E. Sai Kumar and S. Rakshit, Implementation of Topological Derivative as an Evolutionary Approach, International Conference on Recent Innovations and Developments in Mechanical Engineering (IC-RIDME 2018), Shillong, 8-10 November, 2018. M. D. Aravind and Sourav Rakshit, Study of The Effect of The Circular Control Cylinder on The Flow Around Circular Main Cylinder at Low Reynolds Numbers Using An Immersed Boundary Method, Proceedings of the 1st International Conference on Mechanical Engineering, Jadavpur University, Kolkata, 4-6 January, 2018, pages 164-167. Tejas Tamboli and Sourav Rakshit, Heuristic Selection of Grasp Surfaces for From-Closure on Polyhedral Objects, 3rd International and National Conference on Machines and Mechanisms (iNaCoMM 2017), Mumbai, 13-15 December, 2017. Atul Khorade and Sourav Rakshit, Optimum Support Layout Design for Periodically Loaded Structures Using Topology Optimization, 13th International Conference on Vibration Problems, Guwahati, India, 29 November – 2 December, 2017. K. E. Sai Kumar and S. Rakshit, Optimal Design of Structure with Specified Fundamental Natural Frequency Using Topology Optimization, 13th International Conference on Vibration Problems, Guwahati, India, 29 November – 2 December, 2017. K. E. Sai Kumar, S. Rakshit and S. Natarajan, Comparative study between FEM and SBFEM in topology optimization, Indian Conference on Applied Mechanics, Allahabad, India, 5-7 July, 2017. Sourav Rakshit and Srinivas Akella, A Trajectory Optimization Formulation for Assistive Robotic Devices, IEEE International Conference on Robotics and Automation, Stockholm, Sweden, 2016, pp. 2068-2074. Sourav Rakshit and G. K. Ananthasuresh, Simultaneous Geometry Optimization and Material Selection for Truss Structures, ASME International Design Engineering Technical Conferences and Computers and Information in Engineering Conference, Philadelphia, Pennsylvania, USA, September 10-13, 2006.